Until 16 July, the 30th Division was still under XIX Corps, and took part in the coordinated attack by that corps on 15 July. At the end of the day, VII Corps' zone was extended east to the Vire, and VII Corps took over the 30th Division. For the sake of convenience, in the present chapter the action from 15 to 20 July will be followed in terms of the two zones, west and east of the Vire, which coincide with corps zones after the first day. General Hobbs planned his effort in a new formation: column of regiments on a comparatively narrow front; this was more or less forced by the terrain, since the ridge slopes were open to enemy observation on both east and west. The 117th Infantry was ordered to lead the attack on a two-battalion front, while the 119th Infantry followed closely in the assault regiment's zone, protecting the flanks of the division and mopping up any resistance bypassed by the 117th. Division Artillery was ordered to support the attack by a 15-minute preparation and successive concentrations; a rolling barrage would then cover the first 1500 yards ahead of the main effort along the ridge road. The 117th Infantry jumped off on a 2,000-yard front, with the 3d Battalion, 119th Infantry attached and its own 1st Battalion in reserve. Supported by the 743d Tank Battalion, the 117th was further reinforced by two medium tank companies from Combat Command B. With the 3d Battalion, 117th Infantry on the right and the 3d Battalion, 119th Infantry on the left, the assault elements pushed forward against machine-gun, mortar, and 88-mm fire. These 88-mm guns, Division Artillery indicated, could be taken out only by close-in support. The opposition given by the enemy was the equal of that on previous days. The 2d Battalion of the 117th was attached to the 119th Infantry during the first phase of the attack, and reverted later in the day to the 117th. command had decided not to evacuate it as a unit, and that the paratroopers were backing up the 902d in their present positions. By noon, United States infantry advances were still progressing slowly under antitank and machine-gun fire. The tankers had also been engaged in a slugging bout through the hedgerows, and on the left two Americans and two enemy tanks had been knocked out. On the right four American tanks had been lost as the result of enemy bazooka fire. mingled, and artillery fire was hard to coordinate. His 3d Battalion had run into a strongly organized position with machine guns, automatic weapons, and dug-in tanks. The American tanks had not been able to lend appreciable support because of the enemy's observed artillery fire. By 2200 the 30th Division had consolidated its new positions astride the ridge road, with the 2d Battalion of the 117th echeloned to the right rear. The 120th Infantry was alerted to move up preparatory to passing through the 117th Infantry and continuing the attack the next day. The 119th Infantry, now commanded by Col. Edwin M. Sutherland, reverted to division reserve, with responsibility for covering the flank toward the Pont-Hebert bridge. Company C, 743d Tank Battalion outposted the road south of Hauts-Vents along the ridge highway while the 823d Tank Destroyer Battalion gave protection against possible enemy tank attacks from the south and west. General Corlett, checking the progress of the advance, was told by General Hobbs that the day's fighting had turned into a slug fest. The 30th Division commander pointed out that on his unit's front, "It is just a matter of going down a ridge and the enemy knows that too." His division had suffered 244 casualties and had taken 54 prisoners. Artillery duels during the day had been intense; the enemy artillery and mortar fire, active, accurate, and effective, had hit 14 different areas, including Hauts-Vents and Pont-Hebert. Their long-range artillery was believed to include two 210-mm guns. Aiding the German's 105-mm howitzers and 150-mm guns and howitzers were self-propelled 7s-mm and 88-mm guns. Against this enemy artillery the Americans guns had fired 25 counter-battery missions. The 30th Division passed to the control of VII Corps at 2400 on 15 July. With this transfer, VII Corps took over the territory to and including the Vire River. General Collins, commanding general of VII Corps, ordered that the attack started by XIX Corps west of the Vire be continued toward the same objectives. So the 30th Division renewed its attack on 16 July, the 120th Infantry picking up the assault assignment. The plan called for that regiment to make two rapid thrusts in close coordination with the 117th Infantry, which took over the role of cleaning up bypassed opposition. Colonel Birks sent the 120th Infantry into action at 1000 the 1st Battalion on the right of the highway and the 2d on the left, each with a tank company, a cannon platoon, and a platoon of engineers in support. The 743d Tank Battalion was prepared to support the assault on call, or to repel counterattacks on the flanks. Enemy resistance again included fire from tanks dug in and used as gun positions; these tanks slowed the infantry advance, but could not stop it. The 120th Infantry bypassed the village of le Mesnil-Durand. Company B, 117th Infantry, following up, entered it later in the day without opposition and occupied the high ground south of the village. The Germans were still adhering to the policy of piecemeal commitment of reserves, apparently thrown in by driblets whenever local tactical needs called for supporting units. German armor, too, was operating in small groups and not in mass. Fighting from hedge to hedge, the Americans had advanced 500 yards on the left and 300 yards on the right by early afternoon. Supporting American armor had knocked out three of the enemy's dug-in tanks, while bazooka fire knocked out two more. Division Artillery support was especially effective in speeding the advance of the 2d Battalion, the shells "coming in just over their heads, and taking them from one hedgerow to another." were knocked out; with the enemy armor destroyed by the 120th Infantry, this brought to 16 the total of enemy tanks destroyed during the day's operations. In spite of stubborn enemy resistance, the 120th Infantry was still making good headway when, at 2000, Colonel Birks called a halt. The 2d Battalion was somewhat out in front, and Colonel Birks also was aware that many bypassed enemy groups had not been cleaned up during the day. He therefore ordered his troops to consolidate in preparation for the next day's attack, and requested air to hit the road junction, and the ridge road beyond Haut-Denier. to enemy movement or maneuver, General Hobbs had always to watch for local counterattacks on that side of the ridge. The 30th Division was still in a salient, with up to two miles of exposed flank on either side. At 1300 on 16 July, Combat Command B was relieved from attachment to the 30th Division and reverted to the 3d Armored Division. During its fighting in the sector west of the Vire the combat command had received 131 casualties and lost 24 tanks to enemy fire, mainly by bazookas. The armored units had done hard fighting and were sorely in need of rest, repair, and maintenance. Beside lending active support to the 30th Division units, Combat Command B had captured and held the vital ground at Hauts-Vents since 11 July. 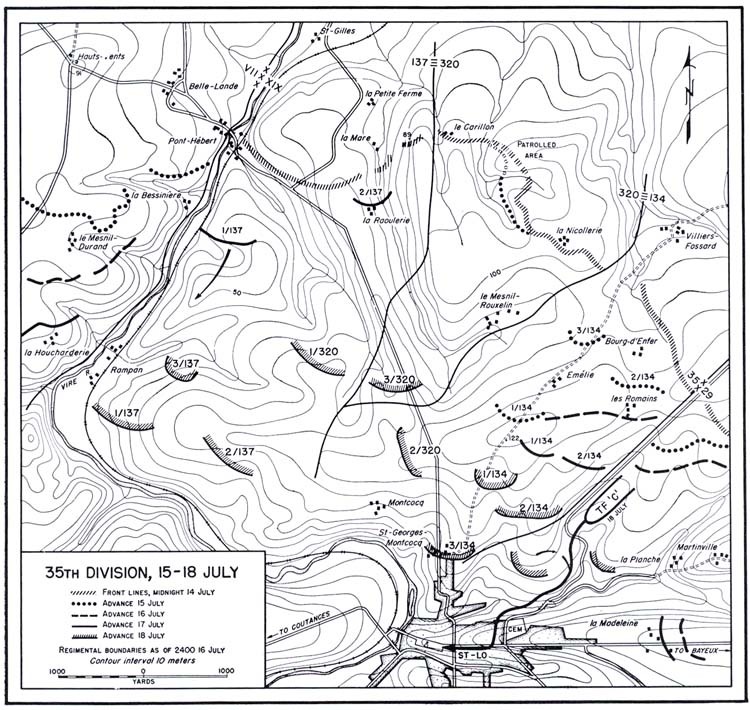 From 17 to i9 July, the 30th Division rounded out its gains down the ridge. (See Map 19.) An attack by the 120th Infantry on 17 July still met heavy opposition, but got as far as la Houcharderie. Two enemy counterattacks were repulsed, after infiltrating some distance into the 120th's lines. The 117th was ordered to reach the Terrette bridges near la Huberderie in order to help the 9th Division. Colonel Kelly put the 2d Battalion on this job, but they found it very difficult to advance down the ridge slope under accurate observed fire from high ground on the other side of the stream. At night they were still 400 yards from the objective, which was taken next day. Preparations were made on 18 July for a last push down the ridge. The 119th Infantry was brought into line on the left of the 120th. Next day, the two regiments attacked on a three battalion front; enemy resistance was light, and the 30th Division organized an MLR in positions from which it could interdict the St-Lo-Periers highway by rifle fire. It was on its objective. On the right flank of the 30th Division, the 9th had come up abreast in hard fighting along a broad front. 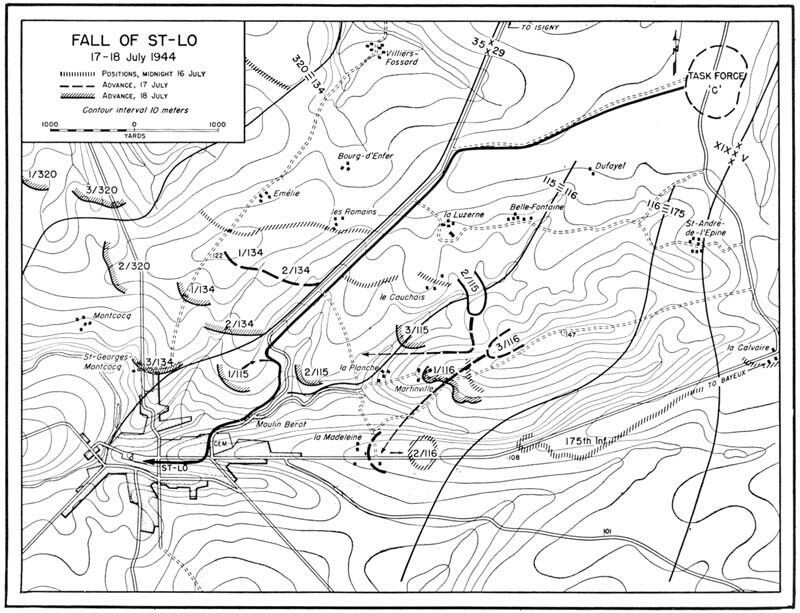 By 15 June, the 9th had cleaned out the German strongpoints east of the Taute and gained the crossroads at les Champs-de-Losque. But just south of that village, the 9th struck the enemy's new MLR, defending the higher ground rising toward the Periers-St-Lo highway. For the next two days of very severe effort, net gains were negligible. Finally, on 17-18 July, the 39th Infantry broke through; during these two days the 9th Division pushed to within a few hundred yards of the St-Lo highway, and crossed it with patrols. The 9th and the 30th together had gained the ground which First Army proposed to use for its jump-off in the breakthrough operation, COBRA. 30th Division intelligence estimates placed German strength on the division front, as of 20 July, at about 2,000 men. These included battered units belonging to Panzer Lehr, 14th Parachute Regiment, and the 275th Division. The German Seventh Army found it necessary on 15 July to commit a battalion of the recently arrived 24th Parachute Regiment (5th Parachute Division) to help Panzer Lehr check the American advance west of Pont-Hebert. Panzer Lehr reported its resources were not able to "stem the enemy onslaught," and still another battalion of the 5th Parachute Division had to be committed. Seventh Army registered its disappointment over the necessity of throwing in new units, immediately on their arrival, thus using up reinforcements planned for building reserves. Army also complained of its losses in materiel, caused by American air and artillery action. "The battle of supply, unprecedented in severity, had to be waged without noticeable support from our own air force." that the MLR of the 352d might have to be pulled back close to St-Lo. The 275th Infantry Division, erroneously reported to have arrived already in the battle zone, was now delayed in arrival until 8 July, too late to help. A counterattack ordered for 17 July, by Panzer Lehr, had been viewed by Army as its last hope for restoring the situation along the Vire. This attack failed completely, and the day saw further advance of the Americans on the ridge west of the Vire. Seventh Army regarded this set- back as decisive for the problem of whether or not to withdraw 11 Parachute Corps' left wing units. A further blow overtook Panzer Lehr when its left flank was deeply penetrated (by U. S. 9th Division) and American spearheads reportedly reached the Periers-St-Lo highway. Personnel of headquarters staffs were employed in an effort to mend this break in time, and allow cut off troops to get back. The general situation was so grave that Army Group now decided to detach another armored division from the British front to reinforce Seventh Army. To judge by the tone of the War Diary, this was Seventh Army's blackest day in the battle that had started two weeks earlier. On 18 July, Seventh Army felt that the front had stabilized west of the Vire, at least for the moment. But the 17th SS Panzer Grenadier Division was still under severe pressure, and the Seventh Army commander discussed measures of relieving it, during a visit to the LXXXIV Corps CP. Both commanders were anxious to regroup the units of 2d SS Armored and 5th Parachute Division, now scattered on a wide front and intermingled with other divisions as a result of piecemeal commitment. No developments west of the Vire were noted on 19 July. During the lull on 14 July, General Corlett had made some readjustments in preparation for his coordinated corps attack the next day. (See Map VI.) The objective was still St-Lo and the commanding ground encircling it. The main weight was still to be put on the left, where the 29th Division would try once more to push the Germans off their last positions on the hill slopes leading down into the city. To allow greater strength for this main effort, the 35th Division widened its front, taking over a zone east to the St-Lo-Isigny road. For its share in the corps attack, the 35th put the main effort also on the left, where the 134th Infantry had come into line for its first battle. With all three regiments of the 29th Division on line, General Corlett and General Gerhardt planned to shift the main effort of that division from left to center. (See Map 20.) 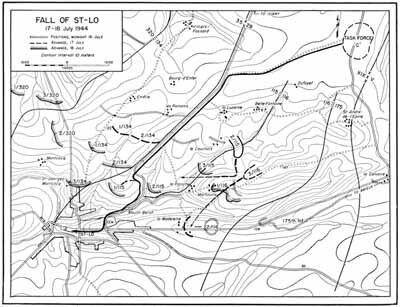 The experience of the 175th Infantry on 13 July had shown the difficulties of advance along the St-Lo-Bayeux highway, where the whole approach was under flanking fire from guns behind the high ground of a parallel ridge. This time the attempt would be made along the Martinville Ridge by the 116th Infantry. Attacking on a 600-yard front, in column of battalions, the 116th was to advance on a west-southwest axis, through la Madeleine and on toward the southeast edge of St-Lo. The 175Th Infantry was to hold present positions, and give every possible assistance to the attack by its fires. The 115th Infantry, attacking southwest from la Luzerne, would try to reach the edge of the hills west of Martinville and thus protect the flank of the 6ths advance. Martinville, initial objective of the 116th Infantry, was a hamlet of less than a dozen Norman farmhouses, strung out along the bend of a road that ran the length of the ridge and then wandered into the highway network around St-Lo. Located on the ridge nose, the village was less than two miles from St-Lo to the southwest, and not much more than half a mile from the St-Lo-Bayeux road to the south. The narrow dirt road along the Martinville Ridge was banked by thick hedgerows with a luxuriant foliage screen. On both sides were the usual fields and orchards, with open fields predominating. The fury of the fighting that swept this ridge approach to St-Lo was indicated by the nature of the shelters and dugouts of both enemy and American troops, left along every foot of hedgerow as the battle moved on, and varying from hurried frantic scoops out of the side of an embankment to deep holes so covered with logs and earth as to leave the barest possible opening. From the village several sunken trails led off along the ridge, possibly cattle trails to pastures, and these were supply routes of the enemy, defended from dugouts. The enemy was now expected to continue his determined defense of St-Lo. Prisoners testified that they had been ordered to hold their positions "to the last man" and under any circumstances. But it was the quality of the German troops that insured hard fighting as the Americans battered their way closer to the goal. As on the 30th Division front, where the caliber of the enemy units had greatly improved as the attack progressed, so also the 29th Division met increasing use of enemy parachute and engineer troops, although not in such strength as to indicate any chance of counterattack. The enemy had strengthened his position with more self-propelled guns, firing directly into the hedges, and with fire from machine guns mounted on half-tracks for quick close- in blows. Reports from First Army indicated a considerable movement of enemy forces west toward the Army sector. The exact time of the arrival of any of the units of the 343d Division, 11th Panzer Division, and 272d Division, believed to be moving as reinforcement, depended on delays inflicted by the Ninth Air Force. There was a possibility that one or two combat groups from these enemy organizations might reach the St-Lo front by the afternoon of 15 July. Actually, none of them reached the area before the start of COBRA. advance along the Martinville Ridge. It was immediately hit hard by fire of all types. 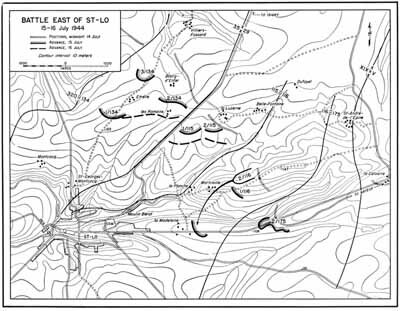 Since the 3d Battalion was the only attacking unit that morning in the sector east of St-Lo, German artillery could concentrate on the Martinville Ridge, and the enemy guns inflicted heavy losses. U. S. observation planes were not able to locate the guns for counterbattery work. Seven medium tanks were lost when a company of mediums and a platoon of light tanks from the 747th Tank Battalion, supporting the attack, became the particular target of the German artillery. During the afternoon Company I was committed on the right flank, north of the road to Martinville, in an attempt to outflank the enemy, but this effort was stopped as the company drew abreast of the bulk of the battalion. To prevent the attack from bogging down, the 1st Battalion was ordered to make a diversionary effort to the south to take pressure off the 3d Battalion. This attack netted an advance of only one field. To relieve the pressure further, the 2d Battalion of the 175th Infantry attacked southwest along the St-Lo-Bayeux road. The troops fought their way along about 400 yards and then they too were stopped. Enfilading fire from the left flank was particularly severe. had 13 battalions hitting 11 targets. Air strikes by 12 P-47's carrying 500-pound bombs had hit enemy 88-mm gun positions, Hill 101, and the high ground around la Madeleine, objective area of the 116ths attack. 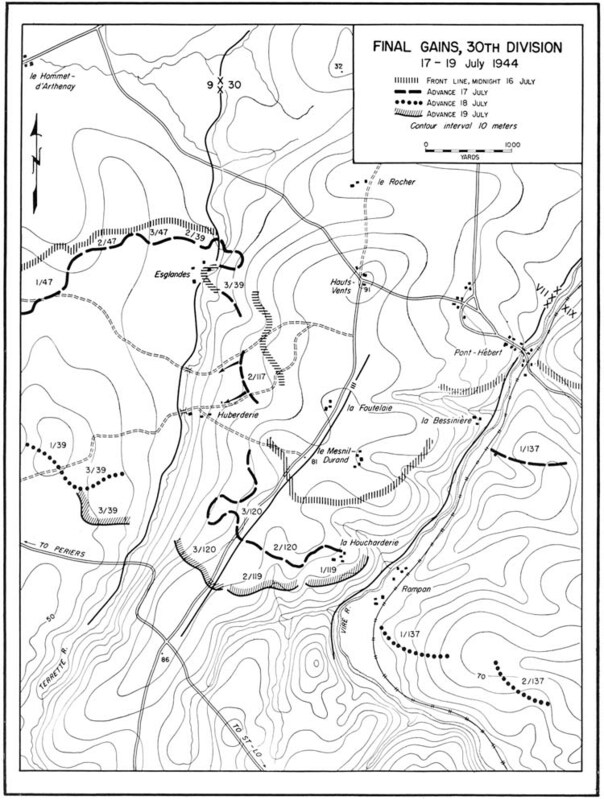 The 116th Infantry regrouped and struck once again along the Martinville Ridge at 1930, the 1st Battalion attacking on the left of the ridge road and the 2d Battalion on the right. They had smashed into the enemy positions and were finally winning ground, when Division Headquarters, aware of severe enemy opposition and lacking an accurate picture of the progress being made, ordered the regiment to button up and consolidate the ground gained. This order reached Major Dallas in time to halt the advance of his 1st Battalion, which had pushed ahead 500 yards, but it failed to reach Major Bingham before his 2d Battalion had got off to a flying start. Major Bingham had returned to check on his rear elements when he was handed the order to hold his battalion and consolidate the ground. By now the bulk of the 2d Battalion was well out ahead. It had been stringing wire as it went, but there was no equipment immediately available to tap in on this wire. Major Bingham started after his advance elements on foot, using their wire as a guide, and caught up with them only when they were practically on their objective, astride the St-Lo-Bayeux highway near la Madeleine. Company F had skirted Martinville, according to plan, but Company G had cleaned it out and rejoined the rest of the battalion. About half of Company G, a squad of Company H, including all of its heavy mortars, and all of the 2d Battalion staff except Major Bingham remained on Martinville Ridge and were later attached to the 1st Battalion. the battalion that night and returned to the 116th Infantry CP the next morning with information that Major Bingham had established a perimeter defense to guard against counterattacks and to conserve ammunition. On the division's right, the 115th Infantry made little progress (luring 15 July. The regiment jumped off in column of battalions at 0515 the 1st leading, on the east side of the Isigny road. A platoon of tanks worked with each assault company, but the armor was hit by fire from the west beyond the road and by 88-mm fire from the south. The enemy on the Martinville Ridge, across a small valley from the 115ths zone, was also able to put in flanking fire. In contrast, the attacking companies and their tanks found it difficult to obtain fields of fire on their immediate front. Infantry of the 1st and 3d Battalions became intermingled, with each other and the tanks. This produced troubles of control; when a unit on the right wavered, both battalions became involved in what threatened to be a withdrawal. But this situation was cleared up in time and the 1st Battalion finally got going. It made 400 yards before intense small-arms fire checked the advance. When the 2d Battalion was committed on its left, in an outflanking try, accurate fire both from the front and the Martinville Ridge stopped it cold. enemy. The 134th made early gains, despite stiff enemy resistance including considerable artillery fire. By afternoon the 1st Battalion had reached Emelie, and the 2d was approaching les Romains. General Baade now directed the assistant division commander, Brig. Gen. Edmund B. Sebree, to assume command at once of a task force which was to reach Hill 122. The force consisted of the 134th Infantry plus the 737th Tank Battalion (less Company B), two platoons of Company A, 60th Engineer Combat Battalion, and one platoon of the 654th Tank Destroyer Battalion. The 3d Battalion of the 134th Infantry was alerted and moved down behind the 1st, encountering resistance from scattered pockets of bypassed enemy but ready to exploit any success of the leading battalions. The 35th Reconnaissance Troop sped into the area to mop up. talion, less Company I. Lt. Col. Alfred Thomsen commanded the infantry forces in the assault. The 3d Battalion was Task Force Reserve. Elements of the 737th Tank Battalion not already engaged were ordered to move east of Emelie, get in the rear of the enemy force opposing the 2d Battalion, and assist the advance of the infantry by disrupting enemy defenses. Company A, 60th Engineer Combat Battalion supported the attack of the task force, moving up with 3,000 sandbags, basic loads of wire, and 300 antitank mines, in readiness for prompt consolidation of the position. The 134th Infantry started its attack after P-47's strafed and bombed enemy positions on Hill 122 and after a 15-minute preparation by Division Artillery. Severe enemy opposition was overcome by the weight and determination of the attack. By 2300 Companies A and B, after a gain of more than a mile, had reached the north slopes of Hill 122 and began work on positions for all-round defense against a counterattack. During the day the 92d Chemical Mortar Battalion had fired 7,000 rounds in support of the attack, while 35th Division Artillery had put in its heaviest day so far, firing 11,000 rounds. 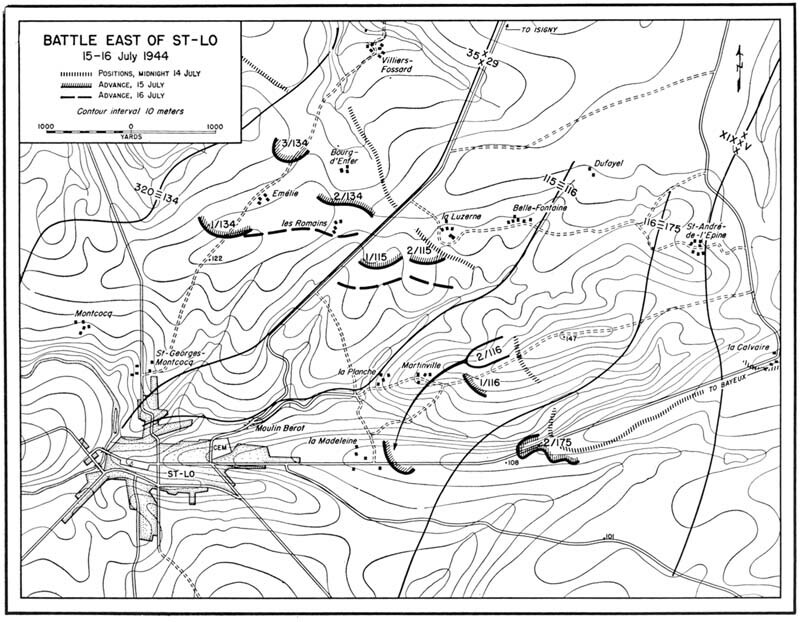 On the rest of its front, the 35th Division made little or no gain during 15 July. While the main effort was being put in other sectors, the enemy strongpoint on the nose at le Carillon still held firmly, now forming a sharp salient into the U. S. lines. East of it, the 320th Infantry discovered that the Germans had reinforced some positions with engineer personnel used as infantry. Even with effective support by tank destroyers, the 2d Battalion of the 320th gained only four hedgerows; later it was learned that the enemy had captured a copy of the regimental attack plan. The 137th Infantry was unable to get beyond the Pont-Hebert highway, and lost 117 men during the day's fighting. In net result, the battle on 15 July had been inconclusive. The 29th Division's effort had produced results only at the very end of the day, and then by an advance which left the spearhead battalion dangerously isolated, 1,000 yards ahead of the rest of the front. The 134ths advance to Hill 122 was promising; it threatened to cut off the enemy salient north of the Vire bend, and put the 134th Infantry only 2,000 yards from the outskirts of St-Lo. Intelligence reports brought cheering indications of German difficulties in coping with the continued pressure of XIX Corps attacks. Enemy units were attempting to operate with drastically reduced strength, were hampered by a shortage of food, water, and ammunition, and were forced by lack of gasoline to extensive use of horse-drawn vehicles. The enemy was still capable of picking his spots and throwing in a local counterattack here and there, but it was evident that he was feeling the strain on all sectors. The 35th Division's advance should now be giving the enemy as much concern as did the battle east of St-Lo. The German command correctly sized up the American attack as putting its main weight east of St-Lo, and Seventh Army's Diary spoke of a "furious struggle," in which American artillery and air added to the troubles of defense. The 9th Parachute Regiment's units distinguished themselves, warding of eight attacks and destroying seven tanks in close combat. An American penetration in the Martinville sector, noted that evening, was reported to be "isolated." The right wing of the 352d Division was forced to withdraw its MLR west of the Isigny highway (Hill 122 sector). The 11 Parachute Corps was strained to the utmost, and again went on record that no reserves were available. penetration. General Gerhardt did not want to pull the unit back and lose the ground gained. He decided, instead, to keep Major Bingham's force out there, and to reach the 2d Battalion as soon as possible by attacking from north and east in order to force the Germans off the nose and flanks of Martinville Ridge. Vetoing a suggestion by Col. Philip Dwyer, now commanding the 11th, that his 1st Battalion push out that night, General Gerhardt ordered the regiment to send out a patrol to establish contact and take supplies. Part of General Gerhardt's plan for the next day was an attack by the 115th Infantry on a broad front; hope was expressed that the 115th might be able to "sail on down" if it got anywhere at all. But the results were disappointing. The 115th Infantry attacked at o600 on 16 July. The 2d Battalion, opening the effort on the left of the regimental zone, encountered the usual heavy opposition. The 1st Battalion then attacked on the right to assist the advance, but the enemy resisted strongly from positions astride the St-Lo-Isigny road. Mortars, with some aid from mobile 88's, and machine-gun fire, brought the attack to a stop. The 2d Battalion then shifted a little to the right, reformed, and tied in with the left of the 1st Battalion, which also shifted over to the right and at noon resumed the attack. Again, little headway was made; at 1430 both battalions took up defensive positions after a net gain of only 30 yards. In the Martinville area, far from being able to stage attacks that could reach the isolated battalion, 9th Division units were on the defensive all day. The Germans had moved back on the Martinville Ridge, and were also between the 2d Battalion and the 175th Infantry. Apparently the enemy tactics, whether as a result of his limited strength or of ignorance as to the 2d Battalion's location, were to strike at the 29ths units behind the cut-off battalion and prevent its relief, rather than to make a direct attack on the isolated force. The main pressure of German counterattack came along the Martinville Ridge, where the 1st Battalion of the 116th held the front 500 yards east of Martinville village. Along the draw to the south there was a gap of 700 yards between the 1st Battalion and the 175Th Infantry, and the Germans were probing this gap in force. Their artillery was aided, as on previous days, by good vantage points for observation from the ridge south of the Bayeux highway. The 1st Battalion had to deal with two determined counterattacks. Before the first, the enemy artillery barrage was intense and for two hours the battalion was forced to dig in while undergoing fire on the left flank and left rear. The Germans followed up this fire with an attack by three tanks and an estimated 100 paratroopers, armed with flame throwers. Coming out of their holes, the men of the 1st Battalion fought off this threat. The enemy infantry were never able to get close enough to use the flame throwers, and left the slope strewn with dead as they were driven back. A second counterattack came along the ridge from Martinville and hit the battalion on the right. Company A, which was holding the road flank, was in a severely decimated condition. Having lost its last officer on the preceding clay, the company was informally commanded on 16 July by 1st Sgt. Harold E. Peterson, who had been placed in charge by survivors of the unit. Regimental Headquarters had sent a lieutenant with some men from Company B to take over Company A, but the officer was new to combat and followed the suggestions of Peterson. The defense of the battalion's right flank thus devolved on Company A when the enemy attacked with machine-gun fire, supported by a tank advancing along the Martinville road blasting at Company A's hedgerow line. The results of the tank fire were deadly. Raking the hedgerow from one end to the other, it blew out great gaps and caused casualties with every shot. The bazooka team was killed. Other men took over the bazooka and opened fire, but they abandoned the weapon when located by the tank. The entire right of Company A buckled and fell back before the tank fire, and the rest of the company line melted with it. Sergeant Peterson recoiled with the others and aided by S/Sgt. Thomas H. Fried dragged along a wounded man. The company retreated to a hedgerow where the battalion CP was located. Here, under the combined efforts of Peterson, Fried, and a full-blooded Indian, known simply as "Chief," the company rallied. To return to the frontal (that is, north- south) hedgerow meant only further losses. Therefore, the survivors formed a flank behind a lateral hedgerow on the left of their old position. Peterson, with a grenade launcher and some rifle grenades, worked his way up the hedgerow into the next pasture where he was able to obtain a field of fire upon the enemy tank. He registered six direct hits with rifle grenades, forcing the tank to pull out in the direction of Martinville. The Company A survivors returned immediately to their original positions and fire power was built up almost to the extreme right wing of the old line. Peterson placed some of the men to make sure they would spread out enough to cover the flank. Company A, aided by elements of B, had survived the tank assault, but had received 37 casualties. The wounded they evacuated, but taking out the dead meant running an unnecessary risk of further depleting the slender personnel strength. Enemy mortar and artillery fire were hitting the 1st Battalion's position throughout the long summer day. The 2d Battalion, out in front near la Madeleine, held its isolated position all day, receiving considerable artillery and mortar fire, though not as much as the battalion had experienced back on the Martinville Ridge. The expected counterattack never developed. Confusion on the German side, or lack of communications between the enemy artillery and infantry, was evidenced by many German artillery concentrations on positions which the Americans knew were held by the enemy. The enemy's failure to attack was fortunate for Major Bingham's force, as they had no extra ammunition. The troops had brought food for only two meals; water, fortunately, was provided by two wells. There were 35 wounded, and their care became a serious problem since there were only three aid men at hand. Division Artillery planes dropped blood plasma during the day in an effort to save the wounded, but several men died for lack of expert care. Communication between Bingham's battalion and Division was maintained by a single radio, that of the 111th Field Artillery Battalion; this battalion gave excellent supporting fires. Disappointed by the results of the day, General Gerhardt issued new orders for attack on 17 July. (See Map 22.) 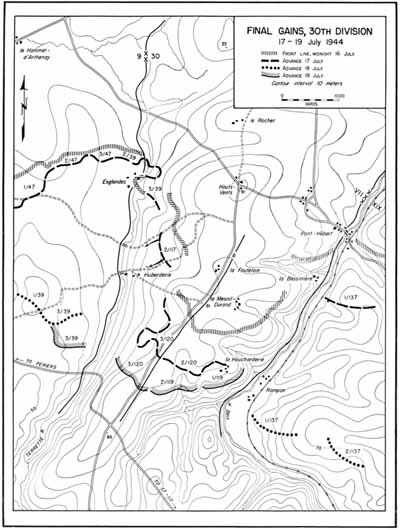 The 115th Infantry was called on to renew its drive toward the nose of high ground north of la Madeleine, commanding the rear of the German positions at Martinville; the 116th was to drive through to the beleaguered 2d Battalion at la Madeleine; the 175th would try again to make progress along the Bayeux highway, past Hill 108. A task force under General Cota was put in readiness to assemble near Couvains on three hours' notice, for completing the occupation of St-L6. General Gerhardt told his regimental leaders that there was a slight shortage of artillery ammunition, and that while there was enough to support good missions, it should be used sparingly. He further directed that bazookas and antitank launchers be kept well forward and that grenades and bayonets be liberally used. On the Martinville Ridge, the 116th Infantry was to make its assault with the 3d Battalion, while the 1st Battalion continued to hold. Colonel Dwyer notified the commanding officers of headquarters, cannon, and antitank companies to have all their personnel ready to move in the morning, as there was no battalion in reserve, and if an enemy breakthrough occurred every man was to be up on the line with a rifle and "fight like hell." Replacements came in on the night of 16 July, 250 men and 19 officers reporting to the 116th Infantry. The enlisted men were assigned to the 1st Battalion, while the officers were divided between the 1st and 3d Battalions. The 3d Battalion was still considerably under strength, its combat effectives totaling only 420.
manding the 3d Battalion, was given no orders to mop up between his LD and the 2d Battalion's position. He made it clear to his men that their primary mission was to get through, and ordered them to rely on bayonets and hand grenades, only two men in a platoon being authorized to fire in an emergency. At 0430 the 3d Battalion attacked in column of companies. Considerable machine-gun and mortar fire was received from both flanks, but following their orders, Major Howie's men did not return this fire. Relying on bayonets, grenades, and rapid movement, and aided by plain luck and an early morning fog, which Major Howie skillfully utilized, they succeeded in slipping between two enemy companies. This got them through the enemy MLR and down to the vicinity of la Madeleine by 0500. At first the 2d Battalion could not be located; then it was found just east of the village. There was still no contact with the enemy, who seemed to be unaware of the new American position and was even attempting to use the north-south road through to la Madeleine to move supplies. Major Howie had not brought supplies to the 2d Battalion, but his men shared their rations. In view of its mission of further attack toward St-Lo, the 3d Battalion was unable to spare ammunition. In the day's plan the 2d Battalion was supposed to lead the attack toward St-Lo, but it was apparent that Major Bingham's force did not have the strength to do the job. Colonel Dwyer, phoning at 0730, asked if the 3d Battalion could make the advance toward the eastern outskirts of the town. "Will do," replied Major Howie. The 2d Battalion planned, therefore, to hold its defensive position, conserving as much as possible its ammunition supplies. These included about five rounds for each of the four light mortars on hand and about a thousand rounds for each of the four light machine guns and seven heavy machine guns. But there was an adequate supply of rifle ammunition, and the men were ready to put u a hard fight if the enemy tried to break their perimeter. At 3d Battalion Headquarters Major Howie, immediately after issuing orders for an advance, was killed by enemy mortar fire which hit the battalion CP. Capt. William H. Puntenney, the executive officer, took command and attempted to organize the battalion for an attack. By this time the enemy's artillery and mortar fire was plastering the entire battalion area. Company K, in front and prepared to lead the attack, was recalled until the battalion could weather the storm of enemy fire, and a perimeter defense was formed adjoining the 2d Battalion. No chance ever came to break out of this defense, since the area remained under constant fire throughout the day. At 1800 a counterattack developed and an enemy group of about 20 men penetrated the American lines. To avoid a split in his battalion, Captain Puntenney decided to button up east of the north-south road, remaining astride the St-Lo-Bayeux highway. It was evident that the enemy was preparing to mount a stronger attack, supported by tanks. A number of these were heard on a road immediately south of the American positions, and one was spotted 200 yards from the village of la Madeleine. Artillery was called for and concentrated with excellent results. As it still was light (about 2000) an air strike was also requested. The 506th Fighter Bomber Squadron, ordered out, got its final briefing from the Division Air Support Officer while in the air, and hit the enemy force shortly after 2105. The 116ths men were instructed to mark front lines with red panels and undershirts, for the target area was close in. The air blow broke up the counterattack completely, many Germans running into the American lines to escape the bombs. Air-ground cooperation had functioned at high speed, and under difficult circumstances, in a critical moment for the 29th Division. Not the least result of the strike was to restore morale and confidence in the isolated battalions. round remained on hand. Fortunately, a German ammunition dump was discovered nearby, and enough teller mines were taken from it to mine both the St-Lo-Bayeux highway and the north-south road through la Madeleine. Captain Puntenney later reported that the battalion "bluffed its way" through the night. Two battalions instead of one were now isolated from the 29th Division and both units needed ammunition, evacuation facilities, and medical aid. The company aid men, who had pooled their efforts, were helped unexpectedly by an Austrian doctor captured on the morning of 17 July. Through his ministrations and the use of blood plasma supplied by air drops, a number of lives were saved. All during the day strenuous efforts had been under way to reach the battalions with supplies and to evacuate the wounded. As part of the attempt to gain control of the intervening ground and thus get the vital supplies through, Major Dallas, commanding the 1st Battalion back on the Martinville Ridge, organized a small task force consisting of 60 men, chiefly from Company C, supported by an antitank gun and a TD. He sent out this force to secure and defend an outpost position immediately east of Martinville. The group worked its way along the Martinville road early in the morning of 17 July and reached the designate position, suffering some casualties en route. Capt. Eccles H. Scott, executive officer of 1st Battalion organized the position for all-round defense. When a second strongpoint had been set up, the 116th had a forward base for effort to reach the isolated units. But the patrol first sent out failed to get through the enemy lines. Later in the day an attempt was made to send two half-tracks, heavily loaded with supplies, through to the isolated battalions. They were to be preceded by two AA half-tracks, which were to machine gun all hedgerows as they advanced down the Martinville road. It was believed that one of two unimproved roads leading south from the Martinville road to the St-Lo-Bayeux road could be used to reach la Madeleine. The drivers found that both of the trails were clogged with debris, abandoned vehicles, and dead horses; engineers estimated a day and a half would be required to open the routes for vehicles. The attempt to send the half-tracks had to be given up. The situation on the Martinville Ridge was rendered more difficult by a heavy barrage of German artillery fire, starting at 1000 and lasting four hours. But other plans for relief were immediately started as alarming rumors came back of tank attacks on the 2d and 3d Battalions. Colonel Dwyer had no means of reinforcing them, and the attacks of the other regiments of the 29th Division were not making headway. the regiment was finally ordered to organize for night defense and then continued its effort the next day. The 115th Infantry fared better, but too late in the day to influence the situation at la Madeleine. At 1500 the 1st and 3d Battalions renewed their attack toward le Cauchais, and made little more progress than the day before. Their effort nevertheless helped a flanking attempt by the 2d Battalion, made according to a plan arranged that morning by General Gerhardt and Colonel Ordway. They had decided to move the 2d Battalion over into the 116ths zone, to the Martinville Ridge; here it would wheel west and attack across a draw toward la Planche, in the rear of the Germans defending le Cauchais. The first stage of the flanking movement was accomplished against only light resistance. At 1600 the 2d Battalion was 400 yards north of Martinville, and it reached the ridge line east of the village by early evening. But while waiting there during the air strike near la Madeleine, the battalion was hit by an extremely heavy mortar concentration, with losses particularly heavy in the heavy weapons units. A shortage of medical corpsmen, which existed all along the St-Lo front, was keenly felt in this sector, where wounded could not be properly cared for that evening. success of the 116ths effort, that night, to reach the cut-off battalions. This time Colonel Dwyer had decided on a carrying party, moving toward la Madeleine under cover of darkness. The personnel consisted of 20 volunteers from the antitank company, under 1st Lt. Hallie F. Williams, S/Sgt. John H. Dillon, and Sgt. Leroy H. E. Hill, and 20 volunteers from the cannon company under 2d Lt. Lewis B. White, II, and Sgt. Francis A. Kioske. During the night, these two volunteer patrols worked their way hedgerow by hedgerow to the positions of the two battalions. Lieutenant Williams of the antitank volunteer patrol was killed by outposts of the 2d Battalion who failed to recognize him, but the rest of the carrying party got through and stayed to fight with the 29th Division's spearhead. The 1st Battalion of the 116th was now called upon to furnish a company to open and maintain a corridor, or "life line" from the Martinville Ridge to the isolated battalions astride the St-Lo-Bayeaux road. The attempt was to be made early on the morning of the 18th. Company A, which was in the process of reorganization, was given this mission. When the new company commander, Capt. James J. Rabbitt, took over Company A on 17 July, it had 23 men, of which number only 6 knew each other. An "old" man was one who had been at least three days in the line. On the night of 17 July the company received 85 replacements, but these suffered 10 casualties from 88-mm fire on their way into the field held by Company A. To encourage and steady the new men, the replacements were intermingled with "old" men in the fox holes. On short notice, Captain Rabbitt managed to reorganize Company A, with the help of his three new officers and of Sergeant Peterson, who had led the company during three difficult days. Then, with orders to open a supply line to the 2d and 3d Battalions across a 1,200-yard gap, Company A moved out. The company advanced past Martinville in two columns, working along axial hedgerows one field apart and maintaining visual contact. Only occasional sniper fire was met. Each column left small combat groups of two men in every field passed through to hold the corridor open. Moving down of the ridge and across the draw toward la Madeleine, the relief party met mortar fire. But they pushed on and reached the CP's of the 2d and 3d Battalions without losses. Captain Rabbitt still had some men left, and sent these back to strengthen the thin line guarding the supply corridor. The two-man combat groups had little trouble holding the route open during the day of 18 July. They suffered no attacks, and the only Germans encountered gave evidence of growing disorganization on the enemy side; a sizable group came down the draw in column, probably retreating, and was mowed down by machine-gun fire. Throughout the day, supplies were brought down to la Madeleine and wounded were evacuated. Whatever their difficulties had been, by the close of 17 July the 29th Division was on the threshold of victory; the enemy's failure to cash in on his opportunity to smash the isolated battalions of the 116th pointed to an early end of the fight for St-Lo. The 29th Division was now everywhere on the inner slopes of hills that led down directly into the ruined city, and on its right the 35th Division had made substantial gains. Held on the 16th of July, the right wing, (137th Infantry) broke through well past the Pont-Hebert bridge on the next day, and kept going. Shortly after midnight of 17/18 July the 1st Battalion of the 137Th was reaching its part of the division objective, in the bend of the Vire River near Rampan. During these two days the Germans had finally pulled out of the salient at le Carillon and were abandoning large amounts of materiel in their retreat. zer Lehr and other units were proving unable to hold the ridge south of Hauts-Vents against the 30th Division. The battle west of the Vire, as is made abundantly plain in the Seventh Army War Diary, played a part in the fall of St-Lo. 16 July caused no fresh alarm on the 11 Parachute Corps sector. Heavy fighting took place in the Martinville penetration area, but by evening Army's impression was that the "mopping up" had been accomplished "except for a pocket." 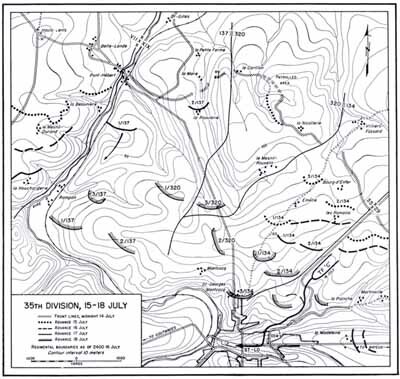 And the 352d Division (now holding a sector corresponding to the zone of the U. S. 35th Division) reported defensive successes. But the loss of Pont-Hebert, and loss of ground past le Mesnil-Durand on the ridge west of the Vire, caused grave concern to the defenders of St-Lo. As stated earlier (p. 101) Army reported to Army Group that the 352d Division's MLR might have to be taken back to la Luzerne-le Mesnil-Rouxelin-Rampan, in order to protect its flank along the Vire. Seventh Army finally postponed this decision pending the attempt of Panzer Lehr to restore the situation between the Vire and the Terrette. That effort, by 17 July, had failed. II Parachute Corps had already proposed that in case of such failure the 352d should withdraw even farther than originally planned, taking up a line from Rampan due east to Martinville, skirting the north edge of St-Lo. The Seventh Army commander discussed this proposal with Army Group by telephone at 0950. Army Group protested that neither Rommel nor Kluge had approved such a withdrawal; but Army pointed out that the 352d was already under pressure that might force the withdrawal whether it approved or not. The course of events during the day only confirmed Armys point of view. The situation west of the Vire got worse, and with all bridges destroyed near St-Lo, the 352d was in danger of being trapped in the bend and losing its heavy weapons. At 1550 Army renewed its request for drastic withdrawal; at 1750 Army Group finally gave Seventh Army freedom to make any necessary decisions. By that time the 2d was in forced retreat; indeed, in one sector the personnel of a regimental CP were battling a penetration. The movement planned and finally approved was already being produced by American advance. "Since no reserves are available, the left wing of the 3d Parachute Division, and the 352d Division are fighting their way back to the line Rampan-Montcocq-la Boulaye." Army Group gave orders to hold and reinforce this line, which would still include St-Lo, but Army took a pessimistic view of the possibility of doing either. The 3d Parachute Division had had no easy day. The penetration in the Martinville area had apparently been "eliminated," when a "new" American attack "reoccupied" the terrain, and advanced to la Madeleine. counterattack at failed to close the gap at Martinville and suffered heavy casualties. Along the St-Lo-Isigny road, too, American thrusts broke through during the day. Among the several misconceptions of Seventh Army, presumably based on division reports during this day, was the belief that American pressure along the Vire, southeast of Pont-Hebert, came from units that had crossed the river at that point. American heavy artillery was credited with destroying two bridges several miles south of St-Lo. By the morning of 18 July General Corlett's unrelenting pressure on the enemy had loosened up the whole front east of the Vire. The 35th Division reported that the enemy had pulled out along its entire sector, leaving a considerable amount of materiel. Army's report suggested confused knowledge about this sector during 16-17 July; it even suggests that Division Headquarters may have failed to locate the 2d Battalion of the 116th during its period of isolation. This would confirm impressions of the 2d Battalion during 16 July that the enemy was unaware of its location and failed to counterattack for that reason. further was launched. The attack was to be made by Task Force C, especially organized for speed and headed by General Cota. Consisting of reconnaissance, tank, tank destroyer, and engineer elements, the task force was ordered to get infantry support from the nearest available infantry unit just prior to the entrance into the city. The 115th Infantry, after days of the hardest battling for small gains, was about to get some recompense. Its 3d Battalion was in Martinville; the 2d was attacking south from la Planche to reach the 116th units at la Madeleine. The 1st Battalion, starting on the old battleground along the Isigny-St-Lo road, made rapid progress during the morning toward the north edge of St-Lo. Their momentum overcame resistance from isolated groups. As soon as the 1st Battalion secured the high ground west of the road, in the vicinity of St-Georges-Montcocq, General Gerhardt decided to alert Task Force C. "Looks like we're all set," he reported to Col. Hamilton E. Maguire, Chief of Staff, XIX Corps. "Leading infantry on the edge of town, pushing on through. Task Force ready to go." At 1430 General Cota called Division Headquarters. "Ready to roll," he said briefly. artillery fire directed from the high ground south of St-Lo might be expected along the road in the approach to the town. The route by the St-Lo-Isigny road had been chosen because the 1st Battalion, 115th Infantry, then fighting on the northeastern outskirts, was the farthest advanced infantry element that could be contacted readily for support. Patrols of this battalion had already probed into the town. In accordance with previous plan, the task force contacted Maj. Glover S. Johns, Jr., commanding officer of 1St Battalion, 115th Infantry, who reported that he was meeting strong machine-gun resistance from about 60 Germans in an orchard to the west of St-Georges-Montcocq. He was ordered to contain the enemy with one platoon and to join the task force with the remainder of his battalion, executing a side-slipping movement to the left and circling around to join the task force at the curve in the St-Lo-Isigny road where it dropped down to the plain. Moving toward the designated rendezvous with Major Johns' troops, Task Force C was temporarily delayed by a partial roadblock, but Colonel Mc- Daniel went to the head of the column and soon had it rolling. Just as the column reached the curve in the road ahead, Major Johns' battalion arrived. The troops fell in along the road, a column in single file on each side, flanking the flanks. As the task force continued its advance, an antitank gun just outside the town opened fire, but was soon silenced by the 37-mm guns of the 29th Reconnaissance Troop. From there on, harassing fire from enemy artillery and mortar was encountered, especially on the bridge at Moulin Berot, which the column crossed in the face of severe artillery fire coming in bursts of ten or twelve shells at intervals of two to four minutes. Scattered rifle fire was encountered as the task force entered the east end of town at 1800. The initial objective within St-Lo, chosen by Maj. Lloyd M. Marr, S-3 of Task Force C, after previous aerial reconnaissance, was a square near the cemetery that had been relatively untouched by bombing. The plan was followed of clearing and occupying this square for use as a base of operations within the town. The 29th Reconnaissance Troop, commanded by 1St Lt. Edward G. Jones, Jr., entered St-LB first and pushed through the rubble-choked streets, using any possible course or route. When it became impossible to proceed farther in vehicles, the men dismounted and deployed like infantry, moving rapidly to seize and organize three strongpoints, previously determined and assigned. These consisted of the strategic road junction of the Rue de Bayeux, Rue de Torigni, and the Rue d'Isigny; the road junction and bridge over the River Dollee; and the junction of the Rue des Noyers with the Place du Champs-de-Mars. The tanks, TD's, and infantry followed the reconnaissance troop into town. A CP was set up at the three-way junction of the main highways. This soon became an exceedingly hot place as, in addition to the artillery fire coming from the high ground to the south of town, an 88-mm gun was firing down the Bayeux road. As the infantry entered, men in groups of four and five were ticked off to accompany a tank or a TD and sent to posts commanding other key points throughout the town. There were 17 of these, including bridges, and they were swiftly outposted. Some of the important areas in the town, such as those originally seized by the 29th Reconnaissance Troop, were reinforced to constitute formidable strongpoints, composed of an armored car, two tanks, two TD's, and an antitank gun. Other outposts were held by small groups of infantrymen armed with bazookas and antitank grenades. have the honor to announce to the Corps Commander that Task Force C of the 29th Division secured the city of St-Lo after 43 days of continual combat from the beaches to St-Lo." upon its use and went to gather his crew. By the time he had returned, the enemy had shot both spires off the church. St-Lo, as the Americans found it, was a shell of the former town, a place of gaunt walls and sprawling heaps of crumbled masonry. The twisted shapes of vehicles lay among piles of rubble. It was as though the whole bitter Normandy campaign had been summed up in this one spot. What had not been bombed out by American air attacks was blasted and rent by artillery, and the destruction was not ended. The enemy shells that came hurtling into St-Lo during I8-I9 July smashed the ruins into further chaos and made it a deadly place for Task Force C. Even German planes made one of their rare appearances on I9 July, five of them strafing and bombing over the CP. On the same evening a party of six Germans, attempting to escape through St-Lo by one of the bridges on the western edge of town, engaged in a fire fight with seven Americans outposting that area. Face to face and only a few feet apart, the two groups shot it out in the street until four of the Germans had been killed, one wounded, and the remaining one captured, while three Americans were killed and one wounded. Incidents like this were the result of rapid advance which had cut off a few German rear guards; the main battle line had moved farther south. The 113th Cavalry Group, in corps reserve since 1 July, had been alerted to prepare to pass through the 29th Division and maintain contact with the enemy who, it was hoped, would withdraw to a new MLR possibly as far south as the high ground just north of Torigni-sur-Vire. The cavalry group was attached to the 29th Division late on 18 July for reconnaissance missions. At 1200 on 19 July, Troop C of the 113th Cavalry Squadron passed through St-Lo to conduct active patrolling on the three main roads leading south, southwest, and southeast out of the town. Contact was to be gained and maintained with the enemy, and any indication of a withdrawal by the enemy was to be reported at once. Troop C, reinforced, took up its mission at 0415 and advanced against little opposition for 500 yards; then it was hit by enemy antitank, mortar, and artillery fire. Serious casualties, which included the commanding officer, Capt. Frank L. Kirby, one platoon leader, the first sergeant, and approximately 30 men, led Troop C to withdraw its vehicles north of St-Lo and undertake dismounted patrolling to the south. On the left flank of the 29th Division, Troop A had also met heavy resistance and its activities were limited to short dismounted patrols and use of observation posts behind the American lines. Here, too, it was apparent that the enemy had made only limited withdrawals. their automatic weapons. They defended their outpost line with automatic weapons, supported by mortars and self-propelled artillery which they moved frequently. Practically all fire was observed from the commanding ground. On the night of 19 July the enemy even threatened a counterattack toward St-Lo. The 1st Battalion, 115th Infantry, defending in the town, spotted enemy activity building up, skillfully anticipated its direction, and broke it up with artillery concentrations and small- arms fire. The 35th Division had advanced rapidly during 18 and 19 July to its objective area along the bank of the Vire, west of St-Lo. (See Map 21.) XIX Corps now ordered it to relieve the 29th Division and assume responsibility for the defense of the entire corps sector. The 113th Cavalry Group and 29th Division Artillery were attached to the the Division. During the next day, the 35th Division organized a line along the Vire River to St-Lo and thence to the corps' east boundary. The 113th Cavalry Group was given the mission of reconnoitering east of the Vire to the corps boundary, of maintaining contact with V Corps, and of combing the division rear area east of the St-Lo-Isigny road to mop up enemy snipers. The cavalry also carried out frequent reconnaissance and contact missions south of St-Lo. Dismounted patrols maintained contact with the enemy, who vigorously resisted the patrolling and actively defended his outpost line. sion of capturing the city, the task force had carried out scrupulously the orders of General Gerhardt by bringing into St-Lo the body of Major Howie, late commander of the 3d Battalion of the 116th Infantry. When Task Force C entered the town Major Howie's body accompanied the spearhead, carried in an ambulance and then a jeep. It was placed before the ruined Cathedral of Notre-Dame, in a gesture of comradeship and respect to an officer who symbolized the Americans' effort, and their losses, in the bitter struggle for St-Lo. Seventh Army put a good face on the withdrawal carried out during the night of 17/18 July, claiming that it went according to plan, and was followed only "hesitantly" by American forces. The German War Diary was still under the curious misapprehension that American units were crossing the Vire to get at St-Lo from the Rampan area. clinging to the idea of maintaining an outpost line of resistance north of St-Lo, but had to face the fact that reinforcements could not be given to the II Parachute Corps. The 275th Division was now, at last, available, but Seventh Army was unwilling to commit it east of the Vire. The army commander ordered the 352d Division not to give up the city, and to repulse with its own resources "the weak hostile units" penetrating the city. Army did loan one battalion of the 275th to help the 352d Division. This order brought no results on the 18th, though German forces were still reported as being north and northwest of the city, holding on by virtue of outstanding artillery support. House-to-house fighting was still going on in St-Lo. The hopes of holding St-Lo were finally abandoned on 19 July, Seventh Army trying to gain comfort from the fact that the town had been defended since 9 June against heavy attacks. German units north of St-Lo got back to the west bank of the Vire, or to the hills south of the city. A new MLR was formed on the east-west ridges, and on the hills to the west commanding the Vire loop. II Parachute Corps no longer had sufficient strength to maintain both an MLR and advance combat posts. The 352d Division, holding positions on both sides of the Vire, was reported to be badly shattered, a high proportion of its men suffering from battle fatigue as a result of their long fight. Corps warned that the unit could not be counted on to stem any major attack. Army found it necessary to make another regiment of the 275th Division available to bolster the Vire sector; once again its plans for hoarding a reserve were being frustrated even before the reserve units had been organized in the battle zone. This left only three battalions of the 275th as army reserve. But neither the 275ths units nor the 5th Parachute Division (committed earlier) were rated highly as reserves; neither had had field training, and their regimental officers lacked experience.